Beautifully upholstered with our ultra soft and durable Caressoft upholstery. 3 paddle multi-function tilting mechanism which allows the seat and back to lock in any position throughout the tilt range. Adjustable tilt tension. 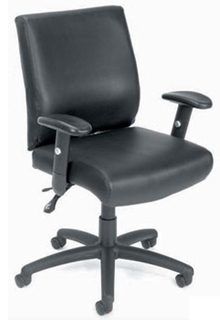 Adjustable height and width armrests with soft polyurethane pad. Hooded double wheel casters. Upright locking position. Ratchet height adjustment on back cushion. Large 27″ nylon base for grater stability. Pneumatic gas lift seat height adjustment. Overall Size: 27.5″W x 27″D x 37.5-40.5″H.